You can eat Longhorn beef for breakfast, lunch and dinner! I even included an appetizer for luck! Try these tasty Longhorn beef recipes. Heat oven to 350 degrees. Spray your 9 x 13 casserole dish. Brown Longhorn meat over medium heat; add basil, thyme, salt and pepper. 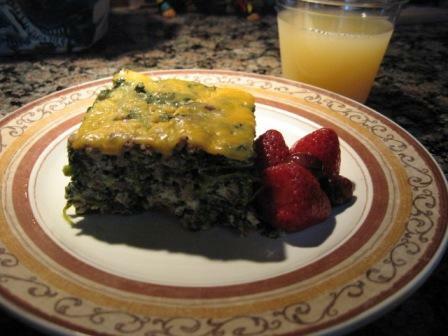 Place thawed spinach in a large bowl; add eggs, Longhorn meat and a hand full of cheese and stir together. Pour into casserole dish and sprinkle the remainder of the cheese on top. Tent with foil. Bake for 1 hour and 15 minutes. Let stand for 5 minutes; cut and serve. I cut into 15 servings and refrigerate the leftovers in a Tupperware container and eat everyday until gone and then make another one. Doug likes his with salsa! YOU CAN EAT A DIFFERENT ONE EVERYDAY AND NEVER GET TIRED OF ‘EM! Tip: When cooking a large number of burgers and trying to keep them warm until they are served, cook the burger until it is approximately 75% done, place in a pan of beef broth over the fire or in the oven. This will keep them from drying out and keep them warm until you are ready to serve. Remember the burger will continue cook in the beef broth. You can make this on the grill using indirect heat or in the oven. I used the oven because we have been experiencing a lot of rain! Set the oven to 300 degrees. Divide the pound of ground in half and worked each half pound into beef balls. Using the beer can you press the can into the beef ball creating a bowl. Pat the beef around the can. Now add two strips of bacon around the outside of your bowl. Carefully pull the can out and make the other beef bowl. Now I washed the beer can really, really well and put it back in the refrigerator! Now comes the fun part! You get to fill your bowl with whatever you want. 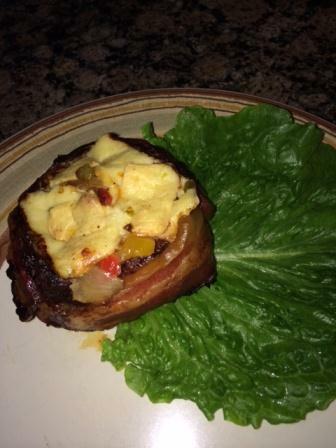 I used sautéed red and green peppers and onions then put chunks of pepper jack cheese on top. I plan to make these tonight and I’m using left over longhorn spicy chili and shredded pepper jack cheese. Yum! So once you fill your bowl you place it in the oven for an hour. I used my cast iron grill in the oven but if I didn’t have that I would use my cast iron skillet and watch to see if I needed to pour off any grease from the bacon. Enjoy! Brown Longhorn ground meat over medium-low heat. Add butter and melt. Add the chopped onion and sauté until golden in color; add garlic and cook for 30 seconds longer. Turn heat to low and add cheese, stirring until melted. 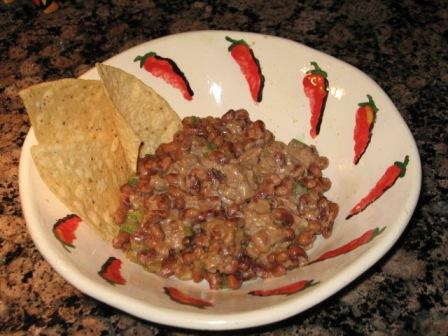 Add the black-eyed peas, chopped jalapeno and green chilies. Cook for 5 minutes, stirring constantly. Add salt and pepper to taste. Serve hot with tortillia chips. You can keep warm in a slow cooker. Brown Longhorn meat in skillet on medium heat. Remove from skillet; set aside. Add potatoes, carrots and water to skillet. Bring to a boil; cover. Reduce heat to low; simmer 15 min. Stir in mushrooms, onions, dressing and meat; cook and stir on high heat 5 min. or until heated through. Makes about 4 servings. Place the meat in slow cooker. In a small bowl mix together the flour, salt and pepper; pour over meat, and stir to coat meat with flour mixture. Stir in garlic, bay leaf, paprika, Worcestershire sauce, onion, beef broth, potatoes, carrots, and celery. Cover, and cook on Low setting for 10 to 12 hours. I found the following information helpful and wanted to pass it along! Selling grass-fed meat at a farmers' market is great work, if you can get it. Folks who are inclined to buy your product are also very likely to make terrific friends. The double bonus is that these folks have a habit of buying your meat and then inviting you to their house to eat it with them Éamazing! I mind my P's and Q's as best I can on these off-farm excursions, but admittedly, I have a teeny control streak that takes over whenever I learn that steaks are on the menu. I offer to cook them for my guests. 1.Wet steak. Thawed steak is going to be moist. In order to sear it properly, it must be dry before you put it on the grill or in the frying pan. If the steak is not blotted dry with a towel before you apply salt and pepper, it will not sear, it will steam. 2.Wrong pan size. If you are cooking your steaks indoors, be sure to choose a skillet that allows ample room to sear them. When the steaks are too crowded, even if they have been blotted dry, the excess moisture will cause them to steam rather than brown, leaving them with an unpleasant gray pallor. Make sure your steaks have at least 1 inch of space around them in the skillet to prevent this from happening. 3.Wrong direct-heat temperature. Often in our hunger for a great steak, we fail to wait for our grills our skillets to heat up properly. If the grill or skillet is not hot enough, the meat will start to roast, but it will not achieve that glorious sear that adds flavor. If grilling, hold your hands about 4 inches above the grate. When you can hold it there for no more than 4 seconds, the grill is hot enough for you to sear your meat. When cooking indoors, place the skillet over a hot flame. When you see steam rising off the skillet, you are ready to grease it with a little fat and begin frying it. 4.Failure to allow indirect cooking time. High heat is critical only when we begin cooking steaks to achieve the sear. A steak should be exposed to high direct heat for no more than 2 minutes per side. After that, in order to guarantee tender and juicy meat, it should be removed from the flames and allowed to finish in indirect or low heat. If you are cooking the steak on the grill, simply move it off the flames and put it on the side of the grill that is not lit, set the cover in place, and allow it to cook for about 5-7 minutes per pound. If you are cooking it indoors, once the steak has seared, transfer the skillet to a 350 degree oven for about 5-7 minutes per pound (or to a 200 degree oven for about 10 minutes per pound). During that indirect time, the internal muscle fibers will come up to temperature slowly without contracting too tightly and toughening. Also, the proteins and sugars will have time to caramelize over the surface of the meat, giving the steak that characteristic glossy look and rich taste. 5.Wrong doneness temperature. USDA temperature guidelines suggest that beef should be cooked to a minimum temperature of 145 degrees. Yuck. When you are using reliably-sourced grass-fed meat, you don’t run the same risks of consuming food borne pathogens. Thus, cook the steak to an internal temperature of 120 degrees for medium-rare, 140 degrees for well-done. 6.Marinating the wrong meat. Did I say there were only 5 commonly-made mistakes? Oops. I just thought of another one. So there are actually six. At my market booth, folks have a tendency to purchase the rib eyes, top loins, porterhouse, t-bones and sirloin steaks when they are planning a steak dinner. Those are terrific if you are planning to season them only with a little salt and pepper. However, if you are planning to marinate your meat, these are the wrong steaks to bring home. These tender cuts of meat have the most delicate flavors, and their beefiness is easily upstaged by most marinades. Furthermore, if marinated too long, the acid in marinades pre-cooks the meat, turning it gray and leaving an otherwise tender steak mushy. If you have a marinade you plan to use, select the lower-priced cuts, such as the sirloin tip or London broil. Those cuts have enough extra flavor and connective tissue to stand up to the marinade. Their more pronounced beefy flavor won't be over-powered by the stronger seasonings, and the acid in the marinade will help break down some of the connective tissue. In my opinion, a marinade should only be applied for a few hours prior to cooking. Excess exposure to the acids in the liquids (such as wine, vinegar or lemon juice) will turn your meat gray, and too much time in the liquid will cause the juices to leak out of the meat. Okay, I've said my piece. If you want to invite me over to dinner now, I promise I won't start bossing you around your kitchen-honestly. But I might bring over a little pop quiz to check first, just to be sure-Would that be too controlling?? Shannon Hayes works with her family on Sap Bush Hollow Farm raising grass-fed meat in Upstate New York. She is the author of The Grass-fed Gourmet, The Farmer and the Grill, and Radical Homemakers. Her newest book, Long Way on a Little: An Earth Lovers' Companion for Enjoying Meat, Pinching Pennies and Living Deliciously, is due out in September 2012. To be notified of the book's release, or to receive her Grass-fed Cooking articles, sign up for the Grass-fed Cooking Newsletter, a free service for grass-fed farmers and meat lovers. Copies of her books can be purchased through grassfedcooking.com at both retail and wholesale prices.